If you’re looking for a game that has been well formed, defined and ready to go… then this thread isn’t for you. I’m sorry to have wasted your time. But! Project Liberation is a project designed to test the scope of OpenORPG and prove the viability by implementing a full game on the technology. It is designed to be a flagship title that runs the bleeding edge software and lead the way for other developers to believe in the technology. Project Liberation is based on a dystopian world in which adventurers are born into. Here, humans have gained the ability to use basic magic to make their lives easier. This is a world with no conflict among the citizens and crime is a low threat due to the heavy monitoring of magic that occurs within the bounds of the village. However, magic is not always so innocent that it would only be used to help clean your home, water the plants or make dinner. While children are taught the presumptions origins of their magic, the elders of the country know the real truth. Humans have a much more powerful capability latent within them. All it takes is liberation. Players will play as adults grown into a small village who will be sent to a temple, per graduation rites, at the beginning of their journey where they will slowly begin to learn the truth about their magic by mistake. … or any other creative field! Then, we should get in touch! This will be a creative project and I would like to get everyone who expresses interest involved in the project in some way. **This will be a creative process. **Those who are apt in game design are especially encouraged to contribute, having well defined requirements will really help. Please send me a private message or leave a post if you’re interested. just wondering, what language is this written in ? Incredibly interested, can’t contribute much with my limited knowledge, but I will be eager to see how this developes. Thanks! Please do keep an eye out. Any type of support is appreciated. I’ve added some repository info and blog stuff to the main post so others can check out progress and get a better idea of how real this is. Vaughan is a great programmer, already checked out the engine myself and is very light-weight and small in code. This is something that has a bright future ahead of it. The engine is looking top notch, looking forward to seeing where this goes! I’ve wrote a tutorial for this. Nin Online is aiming to use this engine as well as helping Vaughan progress it. Open-source for life, I don’t want to end up being stuck with just a closed-source version from Eclipse. 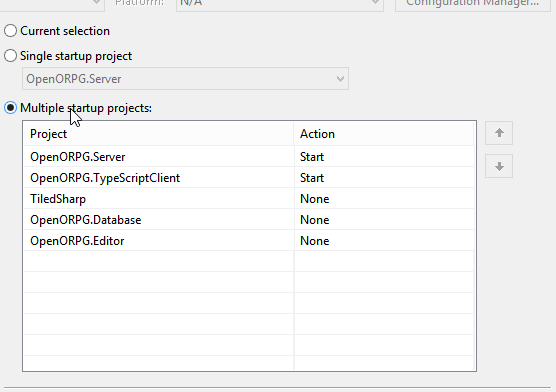 Install TypeScript for Visual Studio 2013. Install Visual Studio 2013 for Web. 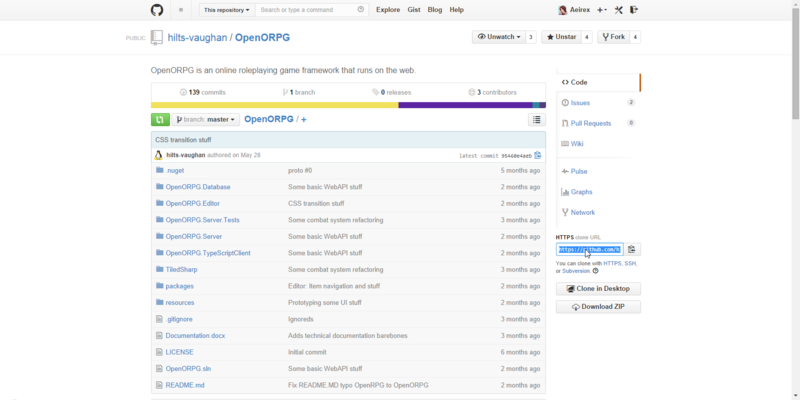 Checkout OpenORPG using Git from SmartGit or GitHub. Using Github you can simply drag the URL into the client to pull the repository. SmartGit you can simply open up the GitHub repository that is created rather than pulling it. Both clients are good to use. 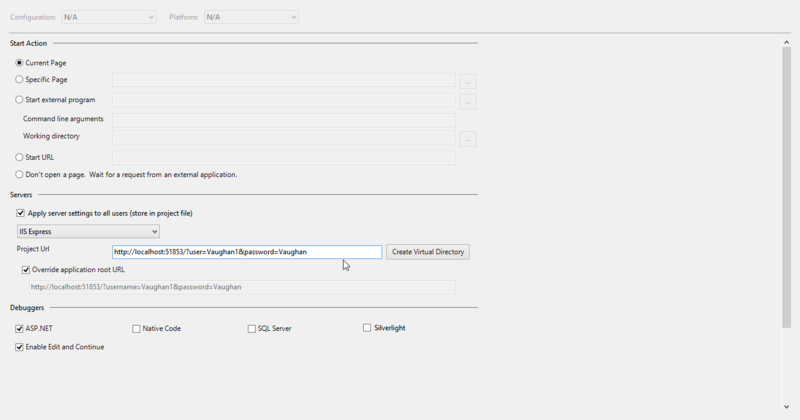 Right click Solution “OpenORPG” in the Solution Explorer. Left click Properties at the bottom of the list. Fill out the startup projects to match that of the image in the spoiler below. Setup the configuration for the OpenORPG.TypeScriptClient project. Right click on the OpenORPG.TypeScriptClient project. Make sure that the Web tab is selected, and the content in it matches the image below. Well, I’m getting pretty decent at programming nowadays, and I absolutely love where this is going. I’ll be sure to check it out and see if I can contribute anything. Thanks. Vaughan is going to resume it in 2 weeks. He has had family in the hospital and been sick recently, which has made him inactive for around 2-3 months. Awe. I hope his family are all okay. This looks pretty nice, Forgive my ignorance but will this be released as an engine or a game or both? I hope to see this go somewhere. Engine. It may be forked since Vaughan just wants an open-source engine, but I want to make an engine that has plugins and is monetized using plugins by authors. Authors make plugins and can release for free or for paid, these then are installed sort of like Minecraft’s Bukkit Server. Everything needs funding to make it, which is why the core is free and open-source, but the actual works made for it such as additional features will be both free and paid. This is the best approach in my opinion and want more engines like this. Going to have to agree with you there. Keeping the core open source and releasing additional features as plugins is definitely the way to go. Install Visual Studio 2013. express? or normal version? What happened to Robin’s Crystal Toolset that listed Nin Online as one of it’s flagship projects?? This does look pretty amazing, I hope it actually gets finished. Inspires very little confidence that it ever will be as that was the same excuse used by hundreds of programmers in the past, including Robin. Um Vaughan has no reason to lie. He would just quit if he wanted to… The Crystal Toolset will not be used unless I can get Robin to want to work on this engine, because I do not feel comfortable asking or even using his tools without him wanting to back the engine himself. It feels like stealing and using.